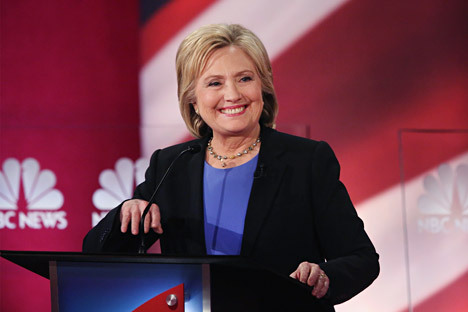 Democratic presidential candidate Hillary Clinton participates in the Democratic Candidates Debate on January 17, 2016 in Charleston, South Carolina. In high stakes debate before selection of the Democratic party presidential nominee, Hillary Clinton articulates Russia policy. In the TV debate between potential Democratic Party candidates for the U.S. presidential race on January 17, 2016, the frontrunner, former Secretary of State Hillary Clinton, did not rule out a “reset” in relations with Moscow. She also described Russian President Vladimir Putin as a “bully” during the debate, held in Charleston, South Carolina. The issue of America’s relations with Russia was raised among the various topics being debated. Clinton was asked if she would provide another “reset” button to Vladimir Putin. Sanders went on to imply that Washington’s main goal should be fighting ISIS with Russia, Iran and other Muslim-majority countries, while removing Syrian President Bashar al-Assad would be next in line as a priority. Who do Indians like: Russia or USA?